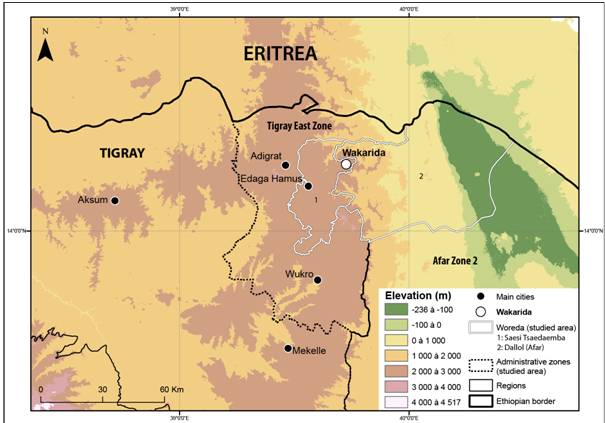 The Aksumite site of Wakarida is located in Northern Tigray, some 30 km East of Adigrat, in the woreda of Seasi Tsaedaemba (Figure 1). The area is surveyed and excavated since 2010 under the direction of Iwona Gajda, Fabienne Dugast (until 2014) and Anne Benoist (since 2015). In the survey area, pre-Aksumite and Aksumite sites have been spotted and some of them excavated, attesting anthropic occupation of the area during these times. Nowadays, the area is densely populated and cultivated, thanks to the building of terraces in the main valleys and on the flatter areas of slopes. This contemporary landscape is typical of the Highlands of Ethiopia (Figure 2). Wakarida lies on a spur, at the northernmost end of the Tigrean Plateau. The area consists of alternating mountains and valleys, with altitudes of maximum 2 500 m a.s.l. The valleys are highly modified by agriculture: the bottoms have been levelled for cultivation through the construction of terraces walls, whereas the slopes are covered by dry stone walls used to prevent erosion (Figure 2). In addition to archaeological excavations, geographical studies are led since 2013, in order to understand the evolution of environments and landscapes since (and before) the Aksumite period. The last campaigns (November 2014 and November 2015) consisted in reconnaissance of the area, survey and description of actual landscapes, and sampling of natural sections. The 2017 campaign was conducted between the 23rd October and the 30th November. 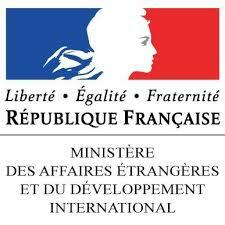 The fieldwork was supported by the French Center for Ethiopian Studies through field grant, and by the French Ministry of Foreign Affairs through the Mission Wakarida. Support was also granted by the University of Lyon 2, through the project RAPATIO and by the laboratory of Archéorient (UMR 5133, Lyon2 CNRS). As the geographical, geoarchaeological and geomorphological approaches of the area around Wakarida are quite recent, the first campaigns being designed as exploratory studies. Main geomorphological features were described and sediment sections studied, described, sampled and dated (with the C14 method) when possible. Our first assumption was that this landscape was a very recent one, based on inherited features (mainly sedimentary fillings) contemporaneously modified through human actions. Dating of sections, sampled during the first field studies, gave ages between the 6th millennium BCE (MWb and Da, see Figure 2) and the 17th Century CE (AMa). A spatial organisation of deposits appears at a wider scale, with older records in May Weini valley, in the southern part of the studied area, more recent in Ka Ebile (to the east) and the most recent ones in Ambare valley, to the north, being the downstream part of this system. This could be linked with human occupation and diffusion, the earlier sites (pre-Aksumite) being found in May Weini valley while more recent ones (Aksumite) in Ka Ebile and May Ayni (Figure 2), attesting of the expansion of population from the south (and the plateau) to the east. It is consistent with ages in Ka Ebile valley, where the section shows important amount of fine deposits (mainly silts) at ages of 380 – 203 cal. BCE and 371 – 199 cal. BCE. These fine sediments, corresponding to steady environmental conditions (forested slopes, low erosion in the valleys and on slopes) (Neboit, 1991) are interbedded with coarse material such as gravel and pebbles, indicating the destabilisation of the environment by land clearing, probably for cultivation, house building and fire. These hypotheses led to other questioning, concerning the continuity of occupation in this area from Aksumite times to the present, the role played by land clearing on slopes in sediment deposition and/or ablation in the valleys, as well as on the age and role of the terraces in the constitution of very thick (up to six meters) sediment deposits. The starting point for the ethnogeomorphological and ethnoarchaeological study of this year was the raising of new questions, and the conviction that they cannot be answered by the researcher only, with a foreign view and short-term knowledge on the situation. Explanations had to come from the most concerned ones: the farmers. In addition, some data were impossible to acquire from abroad, especially concerning climate (temperatures and precipitations). Such contemporaneous data were important, in an actualist perspective, to relate to previously studied sedimentary archives. In addition, it appeared important to study the contemporaneous techniques and practices to link them with ancient ones – on which we have but few information – and to be able to understand their effects (past and present) on erosion and evolution of the landscape. Most of the time, ethnoarchaeological interviews concern the material culture (ceramics, house making, for example. See Aurenche, 2012), whereas in this case, they were aimed at understanding agricultural practices, their continuity through time and their effect on the environment. Likewise, ethnogeomorphology is defined as “a situated, non-relativist response to people–landscape connections that reflects and advocates sentient relationships to place” (Wilcocks et al., 2013). In this work, the concept is more oriented towards the use of ethnology and ethnological interviews as tools for analysing erosional processes, studying landforms and landscapes. Thirty interviews have been led in two periods separated by few days of survey and sedimentological sampling. They were conducted with the help of two translators, Abrha Asefa of Adigrat University for the first 15 and Kibrom Gebregergis of the Tigray Culture and Tourism Bureau in Sinkata for the last 15. The sites of interviews (Figure 2) were chosen according to the studied sedimentological sections, when it was possible. Despite the administrative divisions visible on the Figure 2, some part of the study area is considered as located in Afar region. In these places (Ambare valley and Gali Gade, upstream part of Ka Ebile valley, upstream from Da section), it was not possible to interview farmers, for reason of authorizations and difficulties of translation. The choice also relied on the availability of respondents (who were at weddings or the market on Thursdays and at the mosque for the Muslim ones on Fridays). Two types of respondents can be identified: those interviewed at home and those who were working on their fields. The questionnaire is divided into two main parts, the first consisting of a semi-structured interview, itself divided into two main subparts, one questioning agricultural techniques and methods and their evolution through time, the other focusing more on the role of human occupation in slope dynamics, erosion and sediment stocks, through deforestation and terraces building. Other questions were preliminary questions, identifying variables and background data. The second part of the questionnaire consisted of a photo interview, in which the respondent was asked to give names to different types of agricultural landscape features, if known, and to explain their origin and/or goals. These interviews aimed at answering questions raised from the results of the first campaigns, especially after the sedimentological analyses, the consultation of archives and the geographical surveys. They have been completed by collecting data (geological maps, soil maps, meteorological data, and aerial photographs) from different institutions (Figure 3). Geological and hydrogeological maps of Ethiopia (scale 1/2 000 000) and of Adigrat, Mekelle and Aksum (scale 1/250 000) were found at the Geological Survey of Ethiopia (GSE); ancient travel books and press articles about the Italian invasion of Ethiopia during the 1930s were held at the Institute of Ethiopian Studies; aerial photographs of 1994 and 1964-1965 were to be found at the Ethiopian Mapping Agency; the National Meteorological Agency could provide temperature and precipitation data of four stations near Wakarida (Metchara, Edega Selus, Edaga Hamus and Adigrat) from the 1970s at best until 2017. 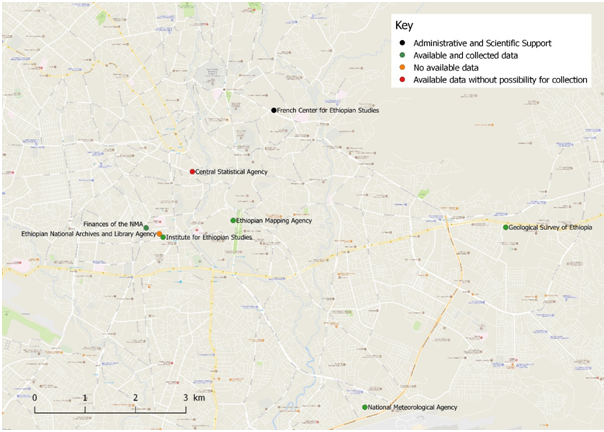 No data was available at the Ethiopian National Archives and Library Agency. Shape files of administrative limits of the country at all levels are available at the Central Statistical Agency but it was not possible to buy them due to current computation of census data. In addition, these data are so expensive that it would have been impossible to buy them. These data – especially aerial photographs – and the results of the interviews can be compared in order to have a more accurate view of the evolution. Answers still have to be precisely computed in a grid, but it is already possible to highlight some of the main features. Figure 4 - Localization of the visited institutions in Addis Ababa and availability of data./ Localisation des institutions visitées à Addis-Abeba et disponibilité des données. N. Blond, 2017, avec QGIS et Google Street Maps. First to be noted in the interviews is the homogeneity of answers on some subjects, such as the building of terraces, the continuity in the use of tools, the land fertility despite shortage of rainfall, and the quite recent date of arrival of most of the population in the area, with important consequences on the environment, especially on the vegetation cover. Surprisingly enough, local people did not seem to have an ancient relation to the landscape they are living in, due to recent arrival in the area: on 30 interviewed people, 5 were the first to have settled in the area, 11 are the second generation (their parents were there before), 11 are the third generation (parents and grand-parents were there before) and only three have mentioned older ancestors.As a consequence, few of them were able to call upon old memories and/or transmitted oral memory. Despite this, 100% of respondents (26) stated that the area was more forested before – meaning when they arrived, or in their ancestors’ times – than today. On 29 answers about the terraces, 3 persons said they were already present, 9 that they were present but have been bettered since (small walls built to separate two land owners converted to terraces, for example). The other 17 respondents (almost 60%) claimed there was none and they had to build them. Through these first few results of interviews, it is possible to draw the hypothesis that the landscape as we see it today is quite a “new” (very recently modified) one. This is consistent with the fact that no evidence of ancient terrace wall has ever been spotted in the sedimentary sections. This leads to a necessary change in point of view about terraces, usually seen as long-established buildings, hard to construct, generally inherited from long date (Blanchemanche, 1990). 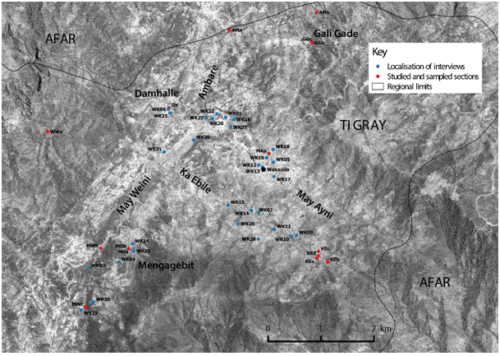 It also raises questions about the landscapes during Axumite times: were they as open as today, with cultivation on levelled fields without terraces but only daget (Nyssen et al., 2010). As had been hypothesized thanks to sedimentary sections, it appeared in the interviews that trees were cut for three main reasons: opening land for cultivation, obtaining wood for construction and fire. This is also visible in the aerial photographs of the area around Wakarida: in 1964, it was more forested, even if the tree cover was not continuous, and some erosion features, spotted on the field and on satellite images were smaller. Few preliminary conclusions can be derived from the first reading of the data collected during this fieldwork campaign, in Addis Ababa as well as in Tigray. They will be refined and developed through compilation, further analysis of the interviews and geo-referencing of aerial photographs, geological maps and meteorological data. First analyses nevertheless indicate that the landscape of Wakarida has been recently modified even if it lies on an ancient basement, which has recorded previous modifications, be they due to human and/or natural processes. AURENCHE O., 2012, Vous avez dit ethnoarchéologue ? Choix d’articles (1972-2007), Collection de la Maison de l’Orient méditerranéen. Série archéologique, Lyon : Maison de l’Orient et de la Méditerranée Jean Pouilloux. BLANCHEMANCHE Ph., 1990, Bâtisseurs de paysages : terrassement, épierrement et petite hydraulique agricoles en Europe, XVIIème-XIXème siècles, Editions de la Maison des Sciences de l’Homme. NEBOIT R., 1991, L’homme et l’érosion, l’érosion des sols dans le monde, 2e éd., Clermont-Ferrand, APFLC., nouvelle série, fasc. 34, 270 p.
NYSSEN J., POESEN J., MOYERSONS J., DECKERS J. and MITIKU HAILE, 2010, “Genèse de rideaux suite à la culture attelée: observations en Ethiopie pour mieux comprendre les paysages ruraux européens”, Bulletin de la Société Géographique de Liège, 54, p. 117-122. WILCOCK D., BRIERLEY G. and HOWITT R., 2013, “Ethnogeomorphology”, Progress in Physical Geography, vol. 37, issue 5, p. 573-600.